Few aspects of League of Legends have changed as much as the Jungle. The neutral PvE area that lies between the game’s three lanes has been iterated on more than any other aspect of the game throughout its decade-long development. Monsters have been added, altered, and taken away again; players’ tools for tackling the jungle have changed dozens of times; and the way teams are forced to interact with this area is now so far removed from some aspects of the original vision as to be nearly unrecognisable. And yet, in a constantly evolving MOBA, the concept of the jungle is one of only a few genuine constants. While the outward appearance of League of Legends might change almost every other week, the PvE environment is part of the unalterable fabric of the game. We spoke to Andrei ‘Meddler’ Van Roon and Jo ‘Fearless’ Graylock – lead gameplay designer and senior game designer, respectively – about the history of the jungle and how it’s changed over time. Most surprising to learn, according to Meddler, is that the game’s original designers expected the jungle to be far less popular than it is today. If you’ve played any League of Legends since around 2011, you’ll know that the game’s meta is relatively static. Each of the three lanes holds a specific type of champion – mages go in the mid lane, bruisers or tanks tend to head for top lane, and a squishy marksman and their support can be found in the bot lane. If the jungle’s there to stop you from locating your enemies then you have to take action yourself. While the support role used to be the stalwart of League of Legends’ vision game, junglers (and the jungle itself) have gradually become a more central component of this aspect of the game. Items like Tracker’s Knife and Wriggle’s Lantern were specifically designed to allow junglers a cheap way to contribute to the vision game. Similarly, some of the jungle’s most important objectives are designed to be shared among all five champions. 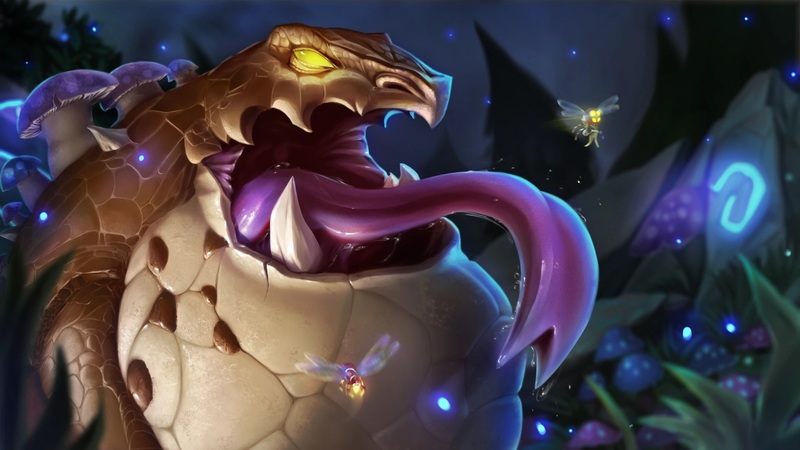 While LoL’s biggest boss, Baron Nashor, has been around for a long time, other major objectives are much more recent, and have been subject to significant change. Dragon, which dwells in the river between the middle and bottom lanes, used to reward team-wide gold to those that defeated it. According to Fearless, that made it “super exciting early,” but “late game, teams stopped appreciating it – it became sort of a consolation prize.” That meant Dragon changed into a buff-based monster, allowing for the production of a major victory-condition sized objective if you’d focused your attention on it throughout the game. 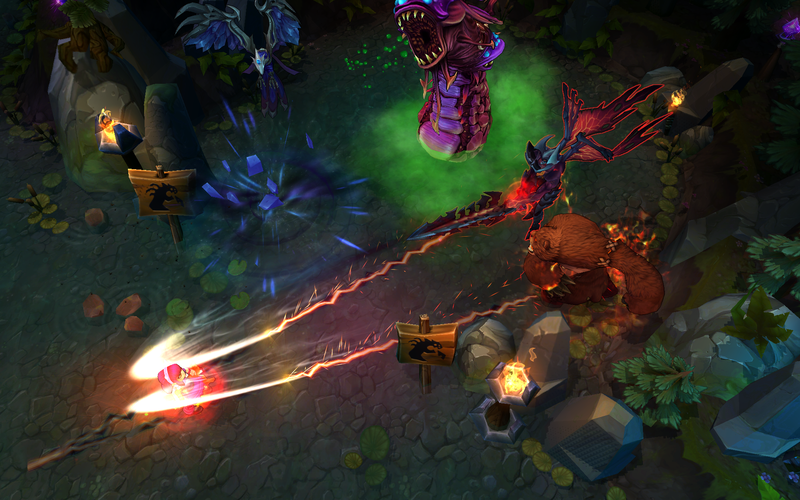 That led to its own problems, however, as it encouraged “a bit too much focus on bot lane.” That issue heralded the arrival of a new early-game objective – enter Rift Herald, a new objective to help top laners contribute to their team’s snowball without having to invest heavily in spells like teleport, or risk giving up their lane pressure. The jungle serves another important role – it’s where most of League of Legends’ in-game storytelling takes place. Summoner’s Rift is a just one tiny part of the game’s wider lore, but the jungle serves up the vast majority of what you’ll see in a given game. Fearless says that the game’s PvE environment “is one of the few places on the map where we give a small amount of character to a large chunk of it. It’s overgrown, we’ve built a lot of details into the terrain, and of course it’s got wildlife.” Birds and butterflies flit around the map, while mice scurry around on the floor. 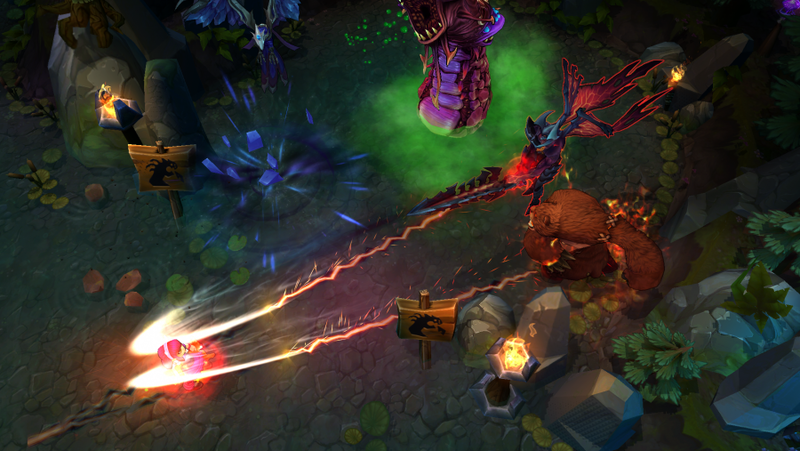 At the beginning of the game, top laners can see a dragon drifting slowly across the top of their screens. The Summoner’s Rift Update (SRU), which took place between seasons four and five, brought a lot of that life to the game. 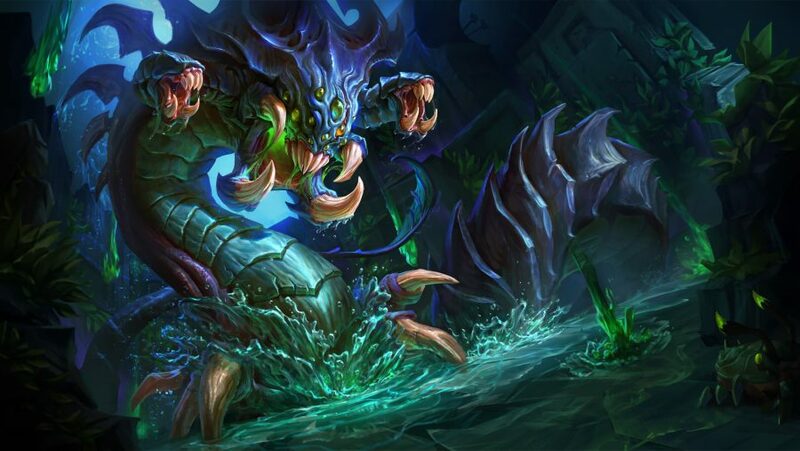 The SRU happened to coincide with major changes to the jungle – the arrival of monster-specific Smite (a summoner spell, a spell not specific to any particular champion), as well as new monster Gromp. The latest League of Legends champion is Pyke, the Bloodharbor Ripper. The Assassin/Support hybrid was new territory for the developer, so we asked how why the team continues to push the boundaries, ever after the game has solidified itself as one of the most popular of all time. That sense of home was transported to another former aspect of the jungle. 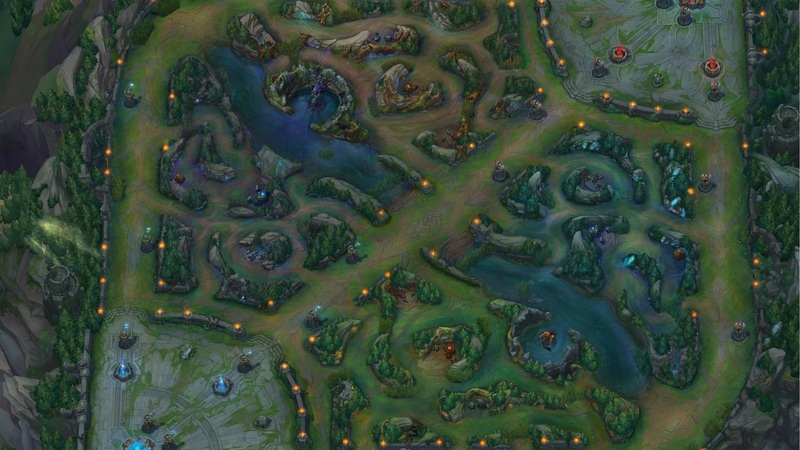 Between Seasons 4 and 6, two iterations of ‘Ghost Wolf’ dwelt on the Rift. One was the Smite bonus for the wolf camp, which would grant a friendly spectre of the now-obliterated wolf to hound enemies who entered its section of the jungle. The second was part of an item, Devourer, which granted its owner a lupine familiar to accompany the jungler on their rounds. 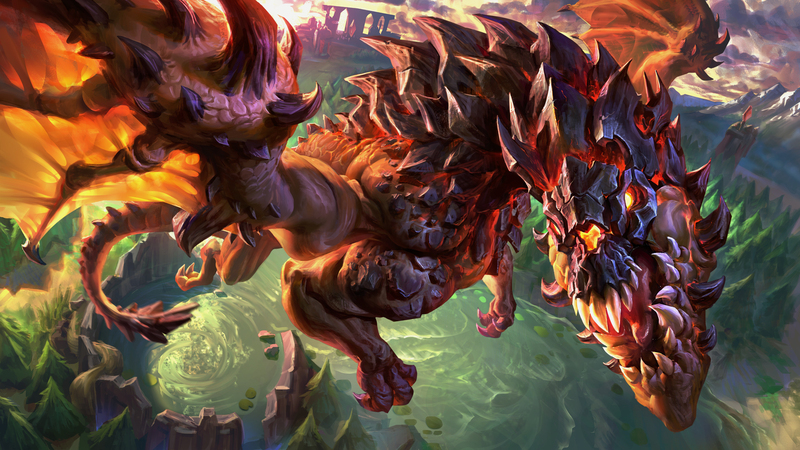 Both iterations have since been patched out of the game, but Fearless says that if they could, they’d bring Ghost Wolf back in an instant: “it’s not the strongest mechanic, but for jungler happiness, and generally happiness in the game, Ghost Puppy was one of the cooler things we had.” Sadly, Devourer made way for Bloodrazor at the beginning of season 6, while the Smite bonus was abandoned a few months later. New champions and items can quickly get absorbed into or swept out of the meta, but the existence of the jungle as a source of income means it’s guaranteed attention for as long as League of Legends maintains a playerbase. Over the game’s long history, jungle changes were such a regular and monumental part of the beginning of each season that they basically became a community joke – while changes to the jungle have died down in recent years, they were one of the game’s longest-running memes. In fact, news that changes were kept to a minimum ahead of the current season came as quite the surprise. The changes have been a crucial part of keeping the game fresh over the past few years; a yearly reset on the area of the game most likely to impact everywhere else. 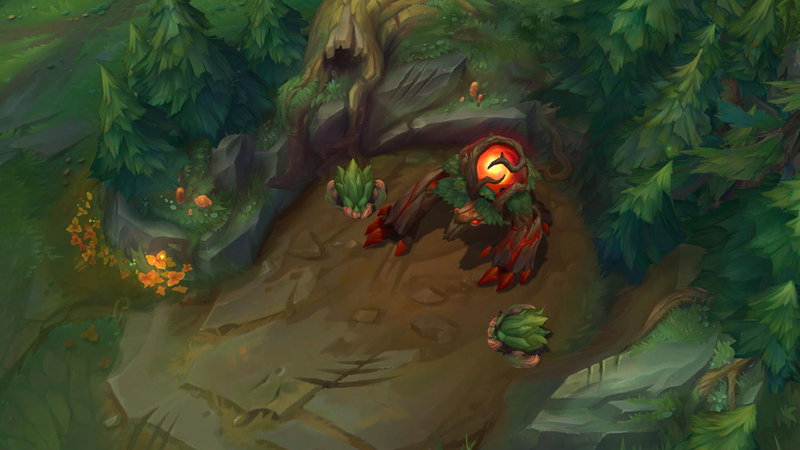 The current jungle is almost unrecognisable compared to its very first iterations, but its impact on every level of the game will likely never diminish.